Richard works throughout the Southern Fleurieu – Victor Harbor to Goolwa and surrounds. Just about any job is possible – just ask and Richard will provide an obligation free quote. Pensioner discounts available. With 25 years’ experience in the tree and garden care industry on the South Coast, VG Garden Care has a reputation for being affordable, trustworthy and reliable. Chris Waller is well known for assisting residential and commercial clients with tree lopping and tree cutting, as well as hedge and garden care, in the Victor Harbor to Goolwa area. VG Garden Care is fully insured with up to $10 million liability* cover. Your complete garden service for the Southern Fleurieu. Jamie Dutch of J & J Gardening is a qualified horticulturalist who prides himself on quality gardening services at competitive prices. J & J Gardening services the Southern Fleurieu region including Victor Harbor, Goolwa, Port Elliot, Middleton, Yankalilla and all areas in between. 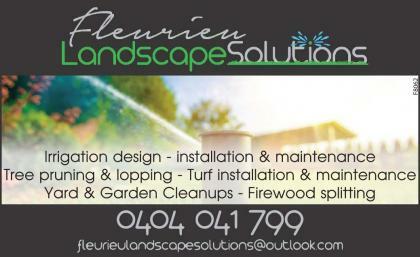 Looking for a professional to carry out yard maintenance? Fleurieu Landscape Solutions is the expert when it comes to landscape and garden work.